A Weed Grows In Toledo, And Residents Hang Their Christmas Hopes Upon It An attempt to bring a little Christmas cheer has grown to capture the imagination of the Ohio city. 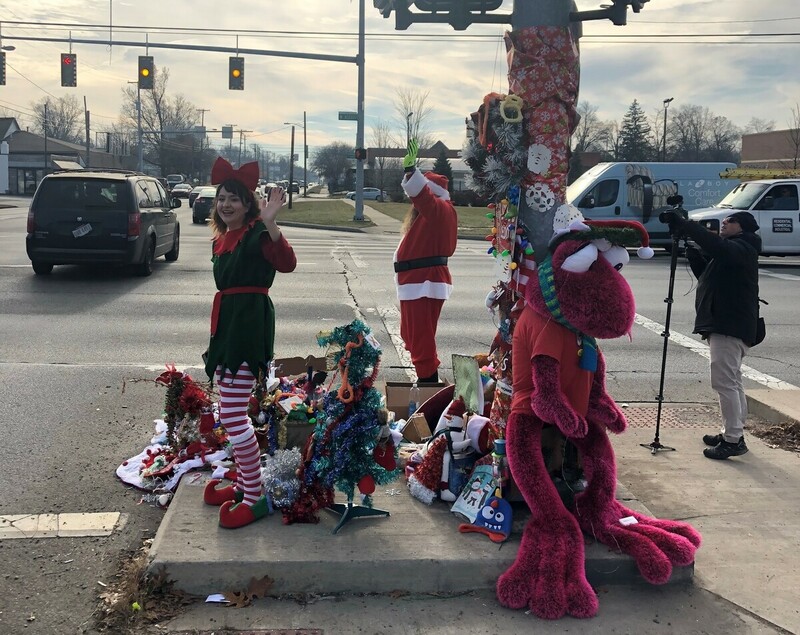 Toledo's Christmas Weed (upper left corner), which is now so heavily decorated that you can barely see it, provided a little holiday cheer at a busy intersection Wednesday. A quick glance at the place where West Alexis and Secor roads meet in Toledo, Ohio, reveals just another intersection of concrete and capitalism: A Western Union, a gym and a chicken joint frame the flow of traffic. But out of a crack in the curb, a scrawny weed pushes forth that has come to embody a city's holiday cheer. University of Toledo student Alyssa Emrick, 20, tells NPR that she and her family had often driven past the weed recently on their way to and from church. Then on Dec. 9, a light went off for her father, Troy. "For a while he has wanted to decorate something kind of random, so when people see it they smile," his daughter says. The weed reminded him of Charlie Brown's spindly Christmas tree, so it fit the bill. The family pulled over, added two pieces of tinsel and moved on, thinking that was that, Emrick says. Now, what's come to be known as the Toledo Christmas Weed has grown into a local phenomenon. Inspired by those two pieces of tinsel, passersby began to add their own flair to the spot: a tree skirt, ornaments, lights, even a toy train set. More motorists pulled over to add decorations; some, to document the cheer. Eric Rohweder was one of them. "Multiple coworkers I work with had seen it on their way to work, and they were all pretty enthusiastic about it, so they wanted to get a picture too," he told The Blade newspaper. Charitable donations began piling up, including warm clothing, blankets and nonperishable food items for the less fortunate. By Wednesday, the city had installed official bins that will remain through Christmas just to contain the contributions. A costumed Santa and an elf were also in place on Wednesday, waving at traffic. A T-shirt is in the works, Emrick says, with some proceeds set to go toward Cherry Street Mission Ministries, a Toledo-based charity. The Christmas Weed has also taken root on social media, boasting its own Facebook page with some 10,000 followers. "This makes me happy and proud to be in a community where simple genuine things like this can bring us together," Jake Ritch posted. "May every town be blessed with such a weed :-) this is amazing," Jennifer Shipman commented. Of course, someone had to be the Grinch in this story. Pranksters tried to steal the weed and managed to cut off some branches, Emrick says. But the weed persisted — somewhat smaller than it once was, but unbroken. "This is surprising — but in the best possible way," she said, "that such a small little weed can have such a large impact on the community, because people want to be part of the community and the little weed has let them do that."